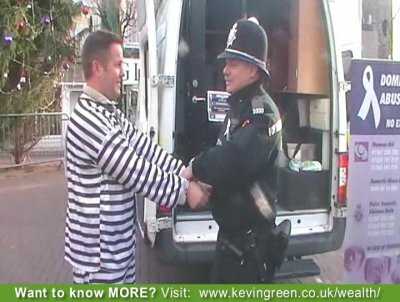 Kevin Green being arrested by a Police Man and locked up in a Mobile Police Cell as part of Carmarthenshire Domestic Abuse Forum's Jail and Bail Day to raise awareness for Domestic Abuse. A year on from my Secret Millionaire episode as seen on Channel 4. I asked all the participants in the programme to a reunion dinner in Bristol. I revisited Amber Foundation yesterday with a very close friend of mine Owen Wood, a person who I met through Secret Millionaire who has some physical limitations yet is amazing at website design and whilst he can’t use his arms to work the keyboard he uses his feet . We gave an inspirational talk to the Amberteers and found out that as a result of the Amber manager Geoff , Geoff and Adele from Little Bridge House meeting up at our dinner there are now plans for the Amber youngsters (Amberteers) to help with the gardens at Little Bridge House. The staff and team leaders at Amber feel that the exposure to the special need children at Little Bridge Hospice would be a very humbling life changing event for the Amberteers and saves money for the Little Bridge landscaping projects. Julie from Barnstaple Property Action group highlighted the fact at our dinner that they are now working more closely with North Devon district council and as result during the past year of involvement in the various meetings the council have match funded my original donation to the outreach rough sleeper project. The reunion dinner was so amazing that we have planned for this to become a regular event and the sight of big Geoff from Amber brushed up and bushy tailed in his suit and looking the business will happen at least once a year. The whole experience of my involvement with RDF production team, the channel 4 Secret Millionaire team and more importantly all the people who were involved in my programme and attended the dinner, spoke of the passion and emotion of the positive experience over the past year, for myself its fully endorsed the fact that we should always listen to our heart before our head and follow our gut feel when making our own life’s decisions. Kevin Green (as seen on Channel 4's "The Secret Millionaire") is proud to announce the next date for his Money Train "1 Day Cash Creation" event in Swindon. The cost is only £145.